As finalists in this international design competition, yesterday we had the pleasure of presenting to the selection committee for creating a new midtown cultural district in the city of Detroit, which will create a new cultural destination within the city. 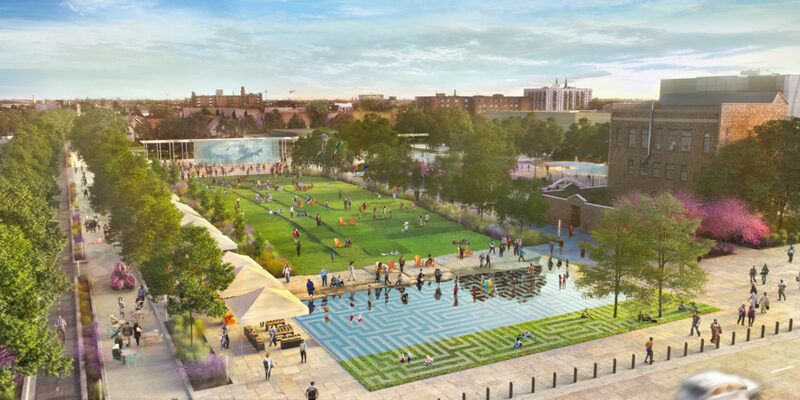 Our plan creates landscape experiences that engage a diversity of experiences– from large-scale seasonal gatherings (such as concerts and art fairs) to everyday, intimate restorative spaces that encourage health and well being (such as active playgrounds and healing gardens). By building on the collective capabilities and astonishing gifts of the Detroit community, our process aims to transform Midtown into a maker district that is welcoming, vibrant and resilient.This phased vision plan proposes a major cultural park, called Midtown Yards, that holds a diversity of activities, encourages healthy engagement, and fosters vibrant programming. In the foreground is the Maze Fountain with is a platform for activity that transforms with use. It’s a playful and restorative labyrinth garden of water, stone and plants that encourages immersive engagement. The sloped lawn that frames this fountain is a flexible platform for both free civic engagement as well as programmed events and art installations throughout the year. Framing this space are ecological gardens, multi-generational playgrounds, the Wright Museum Exhibition Plaza, an Art Walk, an area for restaurants and food truck, as well as a performance stage. This vibrant and diverse destination is designed to be inclusive and welcoming to all Detroiters and visitors; from students to retirees of all colors and backgrounds.